While there are many options for wedges on the market today, sometimes the traditional chrome finish on a subtle, yet attractive wedge package is all it takes to be smitten. 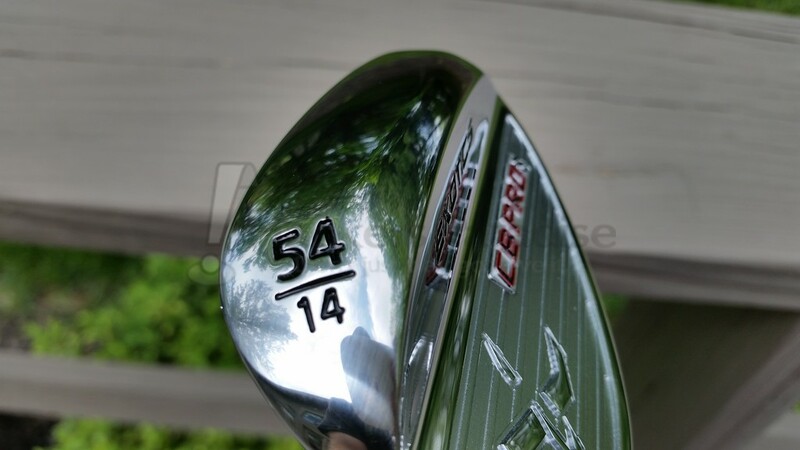 In for review are the Tour Edge Exotics CB PROs wedges in 50 and 54 degrees. 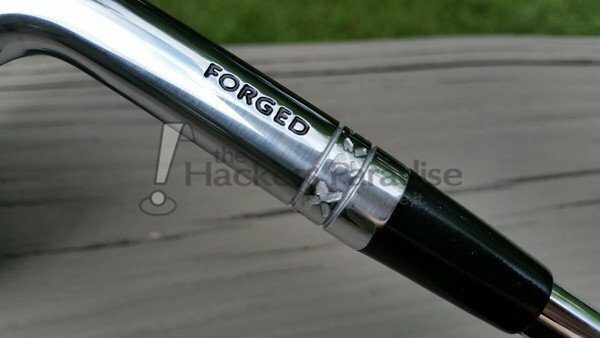 They are loaded with quality feel due to the forged carbon steel head, along with some impressive technology in the MONGO groove design. The CB PROs wedge series features a tour-grind sole design that eliminates bounce from the heel and toe for maximum versatility – so you can take control of any shot you face. Out of the package, the Tour Edge Exotics CB PROs wedges are impressive. A vibrant, slightly brushed chrome finish with an attractive logo and quality design elements really work in favor of the head. 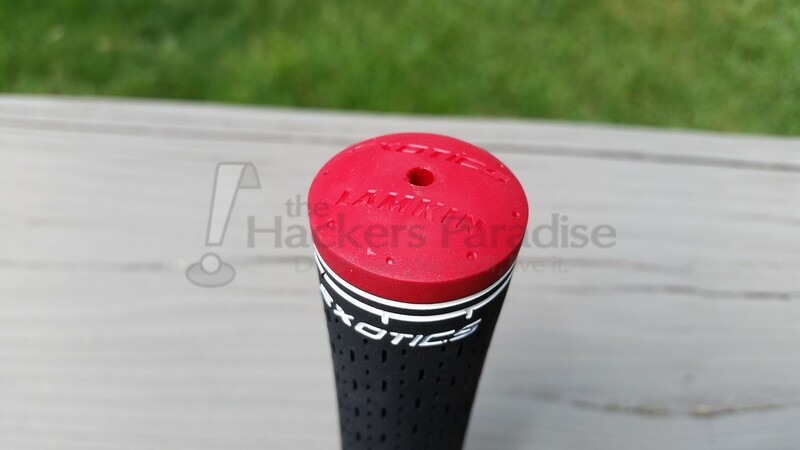 A matte face with MONGO and micro grooves give a great appearance upon address of the ball, making it quite obvious to the golfer where contact should occur. Moving towards the end of the hosel, “X” logos are cut into the upper portion creating a very unique look – one that was not overbearing, but enough to suggest a manufacturer. 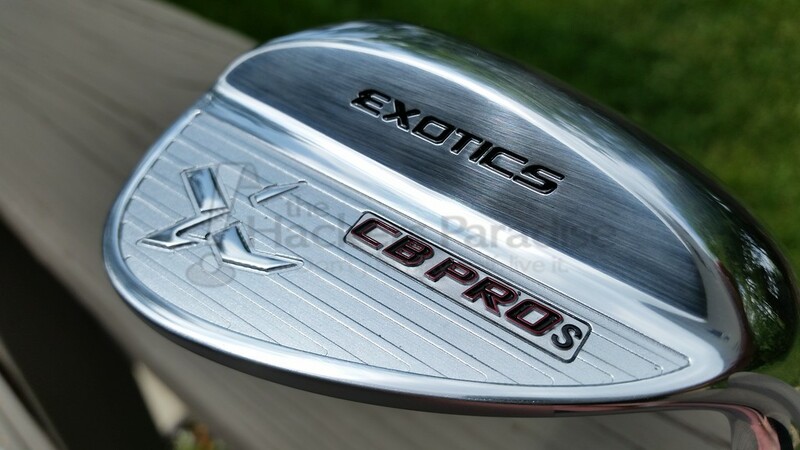 One of the more surprising elements of the CB PROs wedges has to be the weight. Between the head and shaft, they appear to be notably heavier than a typical wedge, and testing suggests that promotes consistent and fluid swing patterns both on full shots and on touch shots around the green. Testing suggested a slight decrease in the overall carry distance on full shots as compared to other wedge options available, but the consistency was on par or better on average. A slightly round leading edge provided ample ability to create a divot when intending to, however the tour grind sole still allowed for some forgiveness when striking the ball heavy rather than with clean contact. Testing suggested the CB PROs are very much in the middle of the spectrum between diggers and sweepers for contact quality, making it a nice package for either style of play. Even low on the face, the contact interaction was forgiving enough to propel the ball forward and lower without major rollout or distance loss. Around the green, the tour grind sole, which is extremely versatile due to the removal of the bounce in the heel and toe sections, performed admirably. Despite not having a loft higher than 54 degrees, the ability to open the face and land a ball softly with limited spin was achieved with ease. 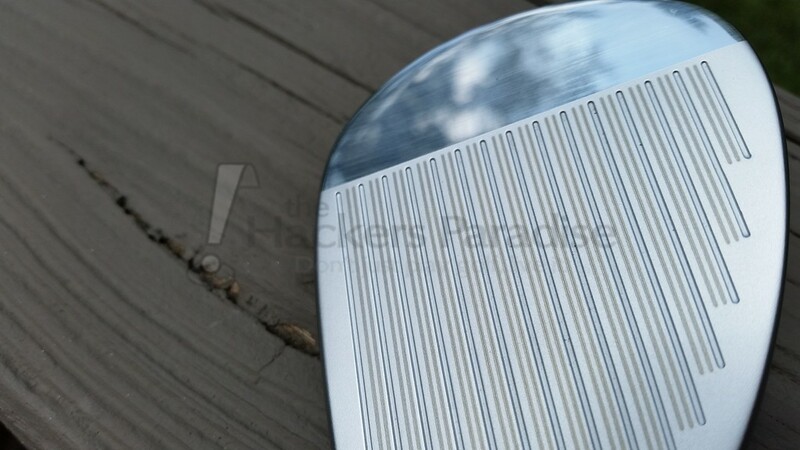 The face opens wide, and again the nice heavy weighting of the wedge seems to allow the club to glide underneath the ball, catching enough on the micro grooves to elevate with spin. 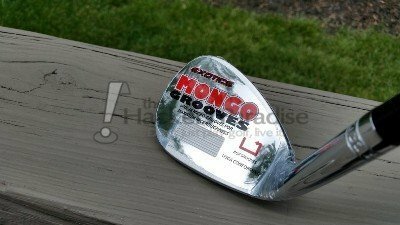 Golfers who enjoy spinning their wedges will really like the Tour Edge Exotics CB PROs featuring MONGO grooves. Adjusted full swings to generate spin proved impressive, with the ball either stopping on a dime or drawing back notably. This spin carries over to the green, where pitch shots and punch shots are met with solid bite around the landing area. Even flop shots around the green are met with a small mark on the green, and a notable ‘grab’ by the ball before rolling to a stop. Surely something that can benefit the type of golfer who enjoys creative ways to stop the ball near the hole. As expected with a bladed wedge, it is extremely easy to manipulate the CB PROs to launch high for a soft landing on the green or to hit a lower trajectory shot that really grabs hold of the green with spin. With the heavier, high launching shaft pairing, the greatest success came from fluid yet powerful swings, which came quite easy at that head/shaft profile. Accuracy and distance control did not appear to be an issue when manipulating the head to add launch angle and spin. Paired with the TEE CB PROs are the True Temper Dynamic Gold wedge shaft and the Lamkin Exotics grip, two products that are consistently strong in performance and are great compliments to the overall wedge package. The 130 gram weighting and stable delivery of the True Temper wedge shaft really works in sync with the mongo grooves to promote higher launch with tough pin positions in mind. The Lamkin quality shines through in an attractive yet functional package, with the red Tour Edge end-cap offering a nice visual touch. For golfers seeking high end spin, solid weighting, and a long lasting wedge package, the Tour Edge Exotics CB PROs with MONGO grooves would be a great option to consider. The diverse sole grind allows for a variety of shots from even the hardest greenside lie, and the rounded leading edge provides confidence in driving the club into the hitting zone. For more information about the CB PROs wedges from Tour Edge, go to www.touredge.com. Nice write-up, Dan. Looks like a nice package from Tour Edge with some really solid performance. Sounds to me like these wedges have everything you could look for. I’m a fan of the increasing number of wedges with different sole grinds. Only downside I see here is the limited number of options, but not sure a brand of TEE’s size can be expected to do much more. Great work here Dan. Nice job Dan, I’m glad to see Tour Edge begin to get the recognition they deserve. These wedges look fantastic and I really like having grind options depending on the conditions. Well done. Really like the review Dan. These are some great looking wedges that sound impressive. The Mongo grooves with the rounded leading edge lookbto be a good pairing for creating good contact with solid stopping power. Another RH-Only option for me to hawkponder. Solid looking wedge, and great writeup, Dan. I am liking what I see and read here. Thanks for the great write-up Dan ! You had me at Mongo Grooves.